Imagine if you could take your cat to the vet for regular check-ups easily. That could make a big difference in the health of your cat. Too many cats don’t get regular wellness visits because of the drama that can ensue with the cat carrier. Then, by the time they do get to the doctor, it’s because they’re very ill.
You have nothing to lose and everything to gain by helping your cat become comfortable with the cat carrier. Start Them Young - If you have a kitten, this is ideal. If they’re not old enough to have negative associations with the carrier yet, then help them make positive ones right from the start by following these steps. If you have an older cat, it will take more patience. But it’s worth it for drama-free episodes when you need the carrier. Make the Carrier Familiar - This is probably the simplest thing you can do to make the carrier less scary for your cat. Think about it from their perspective: you probably keep the carrier hidden away in a closet, the garage, or another out of the way location. Then, right before you need to take your cat to the vet, let’s say, you haul it out. 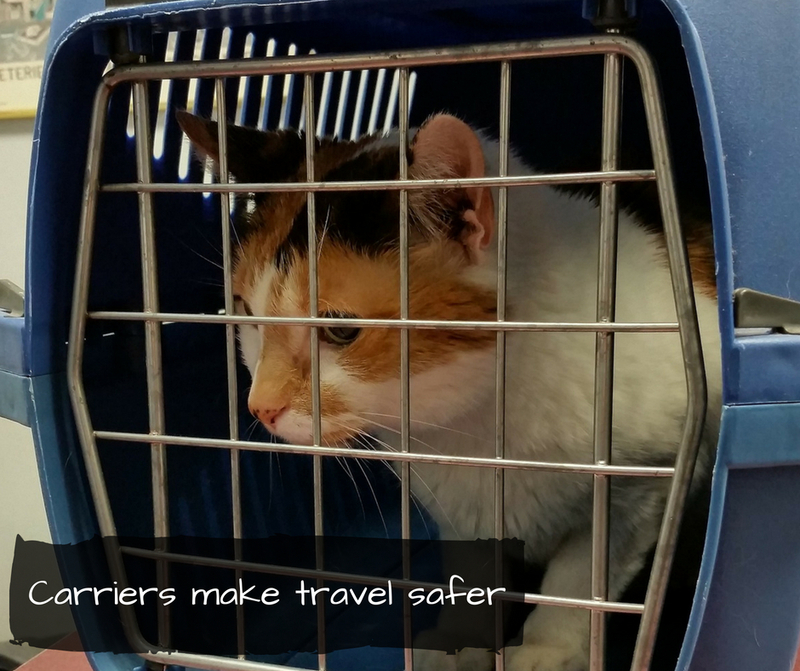 Cats by nature aren’t big on traveling, and they aren’t fans of medical offices. Combine the two and it’s no wonder they’re terrified. However, the best way to conquer fear is to face it. The carrier itself isn’t scary; the fear comes from what it represents. Defang it, so to speak, by letting your cat get to know the carrier. Bring it out of hiding and let it sit in your living room. 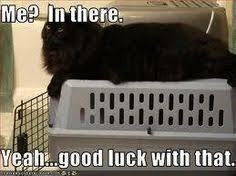 Just like many dogs feel safe in their crates and hang out in them, cats can do the same. Create Positive Associations - Does your kitty have favorite treats? Why not put a couple of them on the floor near the carrier? Depending on how panicked your cat is, you may have to put them down across the room and then ignore your cat for a while -- watch tv, go about your day -- until they see that’s okay. They’ll eventually let down their guard if they see you behaving normally. If your kitty is suspicious but okay being in the vicinity of the carrier, then you can put the treats closer to its entrance. Your goal is to eventually put the treats INSIDE the carrier so that your cat gets accustomed to good things happening there. But don’t rush it. Let your cat’s behavior be your guide. Play with Your Cat Near the Carrier - Continuing with the positive associations, play with your kitty and pet him near the carrier. As your cat gets used to it being in the room and begins to associate it with positive things, then he’ll feel better about it. If your cat likes catnip, you can put some of that inside the carrier once your cat adjusts to it. Practice - Once they’re okay with the carrier being around and even going in the carrier, then practice closing the door and feeding treats to show them it’s okay. Then, let them out. As your cat gets comfortable being in a closed carrier on the floor, you can practice picking them up carrying them across the room. Now this entire process can take days or weeks depending on your cat. As you know, they’re slow to accept new things, so have patience. Eventually, even the most stubborn cats will come to accept the carrier, and some will even like it. Having your cat willingly enter a cat carrier will make life much easier for you. You’ll be able to transport your cat safely to the vet or anywhere else you may need to go -- and don't forget to contact us if you need an appointment! How does your cat handle the cat carrier?